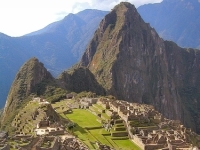 The ancient Inca citadel of Machu Picchu is regarded as the most significant archaeological site in South America and one of the finest examples of landscape architecture in the world. Nestled high in the towering Andes, on a saddle between two peaks, is this most spectacular and enthralling of Inca citadels, 'The Lost City of the Incas'. Totally concealed from below, it escaped destruction by the Spanish, and was only discovered by the western world in 1911 when an American explorer stumbled across the thickly overgrown ruins in their majestic setting high in the clouds. Surrounded by steep agricultural terraces and grazing llamas, the ruins consist of a central plaza, a sacred ceremonial area with intricately carved temples and royal tombs, palaces, stairways, perfectly balanced archways, towers, food storehouses, ornate fountains, and water canals. Highlights of the site include one of the most famous Inca constructions, the sacred Temple of the Sun, with its distinctive round tapering tower and the centre stone that is illuminated by the rays of the sun every winter solstice. Huayna Picchu forms a dramatic backdrop to the city and a treacherously steep stone trail leads to a platform offering dizzy views of the city below and a sweeping panorama of the surrounding mountains and forests. Despite the continuous hordes of tourists the ancient Inca citadel preserves its sense of mystery and majesty, especially in the quieter hours after sunrise and before sunset, when the light and wispy strands of mist create an aura of isolated majesty. Transport: Trains leave from Cuzco and Urubamba to Aguas Calientes, where a bus transports passengers to the ruins. There is also a path leading up to the ruins from Aguas Calientes for those who prefer to walk. Opening times: Daily 6am-5pm. Huayna Picchu closes at 3pm.